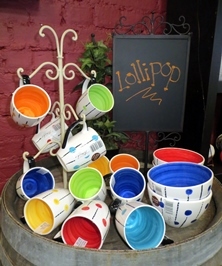 Temuka Pottery is one of New Zealand's much-loved historic brands showcases an evolving product range inside Mendelson Barn, on the State Highway Bypass in Temuka. Welcome to Temuka Pottery, a New Zealand icon. Temuka Pottery retail shop and 100% Homemade Café is a destination, located in the historic Mendelson Barn on the SH1 Bypass in Temuka just north of Timaru. Open 7 days, enjoy browsing the wide range of pottery and accessories, watch historic footage of how Temuka Pottery was developed and made. Potter on site most days, see the process and finished product come out of the kiln. Stay a while, enjoy scrumptious café food and coffee. Relax, with childrens playing area in store. New Zealand, with clean designs created with bright and colourful glazes. Temuka Pottery is immensely proud of its history, and as the only commercial pottery manufacturer in New Zealand we look forward to a strong future. We like to share our enthusiasm for ceramics, and we are more than happy for you to contact us with any comments or thoughts you may have. Check website for full range, and commercial enquiries. Purchase from retail stores or online. Gift vouchers available.